All machines are equipped with magazine type bar loaders. This facilitates 24 hr. uninterrupted production. 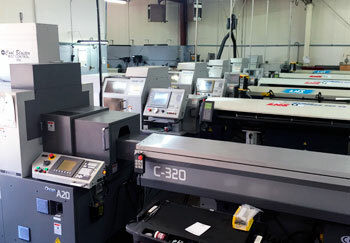 The machines are also all equipped with auto dialers that call our on-call machine operators when a machine alarm occurs during any unattended machining hours. The benefit of a 8-axis machine is that it primarily allows Pacific Swiss the ability to produce simple to extremely complex parts in one machining operation, in which the part comes out of the machine virtually burr-free. There is less chance, therefore, that a part is damaged in a secondary operation. The Swiss machining eliminates any secondary operations and gets the product to the customer faster, thus reducing their time to market. "Our company's biggest strength is that we are exclusively a CNC Swiss and CNC Swiss micro miniature shop. 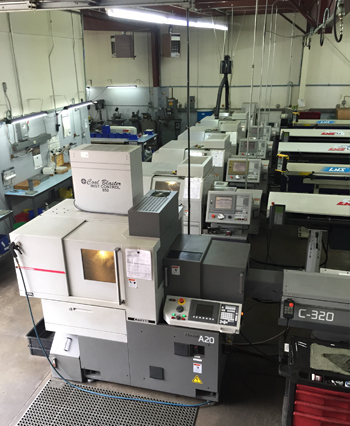 Customers choose us because we are specialists in these two disciplines of machining. We offer dock-to-stock quality and managed inventory systems for our customers. Customers can order large quantities and have deliveries set forth by scheduled P/O dates or by on-demand pull-in." Quality is constantly monitored on all parts, and the quality manager handles the AQL (acceptable quality level) samplings for final inspections. Parts are checked under 20 to 50 power magnification. The 11-ft x14-ft, temperature-controlled inspection room is equipped with an extensive range of inspection tools and gages.